Home > Radio Show > Show Notes: Happy National Home Improvement Month! Show Notes from the On The House with The Carey Brothers and Cameron recorded May 5th, 2018. Find out more about how to buy a lawn mower, how to evaluate a contractor, Summer home improvement projects that cost less than a smart phone and more right here! Terrain – What does your landscaping call for? 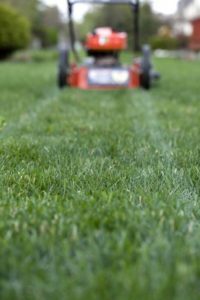 What’s the size of your yard, are there obstacles, and does it have a slope you’ll have to contend with? Pull Cord or Electric Start – Do you want that classic pull cord on a gas mower or do you want the ease of the modern push button of an electric mower? Storage – How much space do you have to store your mower? Do you need a collapsible or foldable handle? Most electric, and even a few gas models, can be stored on the wall of your garage. Want to know more, head over to the full article here! nobody figured out that you could wrap food with it until two decades later! From cleaning to your windows to carpet and tons of things in between, there are all sorts of projects that can get your home ready for summer without breaking the bank. Many of us who have gone into a construction field, did so because we love the work. We love to create and help homeowners bring their home project dreams to reality. But, the business part of it … the paperwork, the hiring of staff, the marketing … isn’t something many of us “love” about our work. Hear more about successful business growth, along with other topics, by checking out our podcast on our website at: CareyBrosPros.com! Years and years ago my father-in-law and uncle wrote a book called “Home Remodeling for Dummies.” In that book, they detail the proper steps to take when hiring a contractor. The fundamental steps, like speaking with previous clients and reviewing a portfolio, are still the same, but, with the increased use of the internet and social media, there are a few additional steps you can take to insure you are hiring the right company for the job. Join us in the coming weeks for more information and head over to the full article in Cameron’s Corner here. Clean ductwork translates to better indoor air quality and up to a 40 percent increase in your HVAC system’s efficiency. 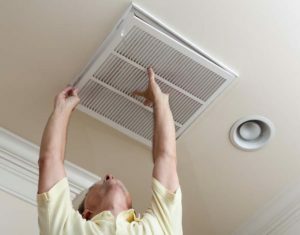 Make sure your air ducts are clean by doing this quick inspection. The next time your heating or cooling system turns on (this generally happens about seven times a day), keep an eye on your air vents. If you notice bits of cobwebs, dust or other debris blowing out of your registers, this is a sign that the ductwork further back (that you won’t be able to inspect from your air vents) may be clogged. Grab a flashlight and a point-and-shoot camera (a flash is important!). Locate your vent registers (most rooms in your home should have one on the floor or along the lower half of the wall) and remove the screws holding it in place with a screwdriver. Once the grill plate is off of your register, it’s time to get down to business! Learn more about it by reading the full article at onthehouse.com here. Utilizing all the space you have can be difficult if that space is unconventional. 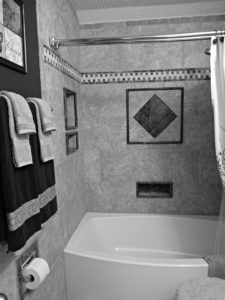 Don’t let a sloping ceiling or a not-so-square wall keep you from your dream bathroom! The Carey Brothers and Cameron discuss ways to make a shower door conform to your small, strange space. Find out more by listening to the episode at the Your Dream Bath website. 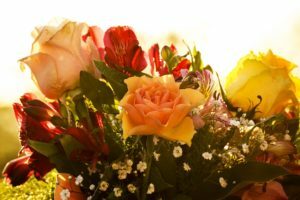 Mother’s Day is around the corner (May 13th!) and if your mom is a DIY champion these gifts will be sure to win you some brownie points and not break your bank. Find out what we suggest here! That’s it for this weeks show. Catch up with us next week at the National Hardware Show in Las Vegas and thanks for listening!